This list summarizes the web links found within the text at the left and below. Pelican Island National Wildlife Refuge. If you are a visitor or you have more company than you have boats here are sione outfitters who can help you. 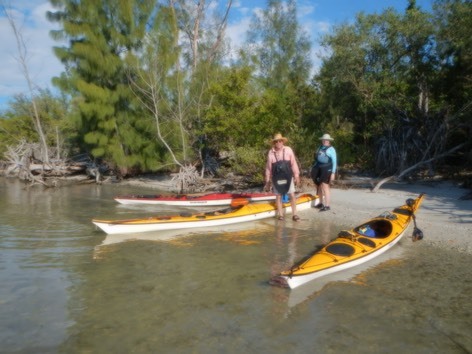 Most of them also offer guided day trips on the Indian River Lagoon. In addition to the spoil islands (or perhaps because of them) the Lagoon is loaded with wildlife. 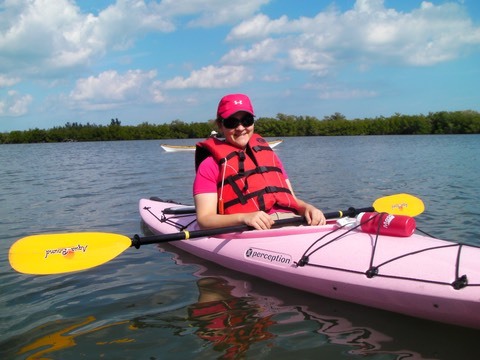 I seldom paddle there without seeing a wide array of bird life, dolphins, mullet, manatees, the occasional shark, and even sea turtles. On any given day, I have such a wide variety of locations I can paddle in that it is sometimes hard deciding just where to paddle. For this blog entry, I will concentrate on put-ins in or near Sebastian, my hometown. The Lagoon is a paddlers paradise. Because it is so shallow, it is off limits to most powerboats. However, when you approach or wish to cross a marked channel you should be vary careful. Cross channels at a right angle, not on a diagonal and cross quickly. Don’t assume that the powerboater sees you. Tides are minimal and do not effect paddling to any great degree. Wind will affect water depth to a much greater degree. The Lagoon is usually calm early in the morning. Around 10 AM a breeze begins and will usually build into the afternoon. Wind is typically from the northeast or southwest and waves can build in open water. 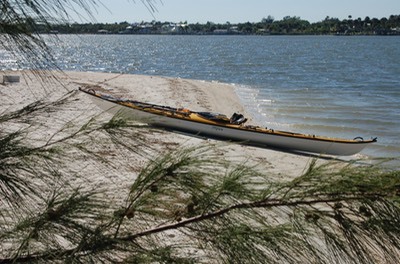 Wind and waves must be considered in planning any paddling route on the Lagoon. Main Street Launch Site: Located at the junction of Main Street and US 1, this is a major powerboat day use launch site. The ramp is wide and can accommodate two vehicles with room to spare. However, there is no separate launch point for paddle craft. The ramp can be busy early in the day as the fishermen try to get on the water. However, once the heavy traffic is gone it is easy to launch from here. Carry your gear to the dock on the left (north) side of the ramp, then carry your boat to the small sandy area just below the dock. Move quickly in setting up your boat so as not to conflict with boat trailer traffic. The Trip: Head out and slightly north toward IR3, a spoil island. Spoil islands are named for the county where they are found (in this case, Indian River County) and numbered from north to south, starting with number 1 as the northern most island in the county. It is easiest to pass behind IR3 because a long sandbar almost reaches shore on the front side. As you pass along the southern shore of IR3 you may notice the wreck of a large research vessel through an opening in the trees. Watch for Osprey, dolphins and manatees as you pass through this area. 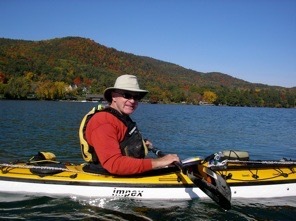 Continue paddling north along the eastern side of IR3, then head toward IR2. IR2 is a protected wildlife island, off limits to humans. But it is interesting to see the many birds that nest here. As you approach, be sure to stand far enough of the shore so as not to disturb any of the residents. Watch for brown pelicans, cormorants, anhinga, vultures, ibis oystercatchers and the giant white pelicans that may be gathered on the western sandbar. Again, pass along the back (eastern) side of the island watching for nesting heron, egrets, pelicans, osprey and more. In the water watch for dolphins, rays, mullet and manatees. 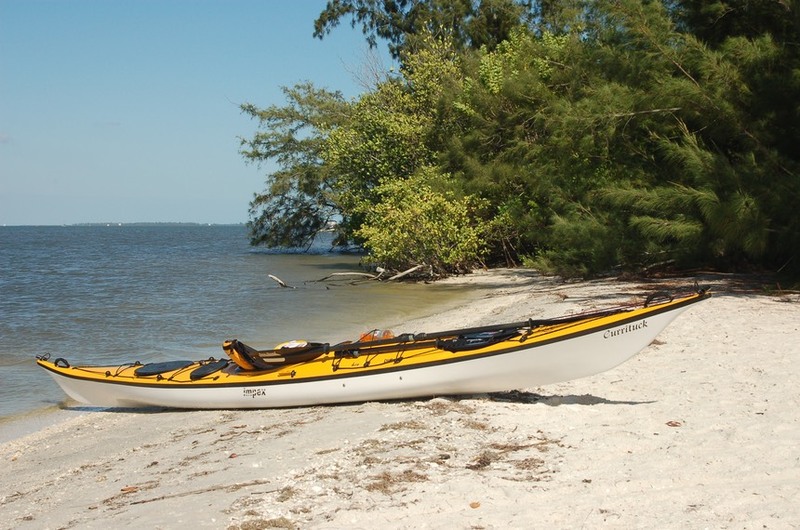 Now head for the first island in Indian River County, IR1, my favorite island. It’s a slightly longer paddle to IR1, but this area is usually where I’ve seen the most dolphin and manatee action. It’s the only place where I’ve seen a sea turtle. If you spot one of these creatures, slow down or stop to watch. It’s a wonderful experience to be near, sometimes surrounded by these large water mammals. Paddle behind IR1 close to shore still looking for wildlife. IR1 is a great place to take a break. It is a popular spot for powerboaters and fishermen on weekends. Jus look for a spot where both you and they have your own space and some privacy. I particularly like the south end of the island and have camped there. Now it’s time for the return trip, paddle the inside this time, passing all three islands. Skirt the shoreline and avoid the sandbars, still keeping an eye out for wildlife. If you want to get a closer look at the wreck on IR3, paddle into its shallow lagoon. At its far end you’ll find the wreck, a victim of a past hurricane. You will pass Captain Hiram’s Resort and the Sand Bar (that’s its name) on your right as you return. If you have time, pull your boat up on the beach and have a cold drink. Not long after passing Hiram’s you will arrive at your launch point. The distance is about three miles. 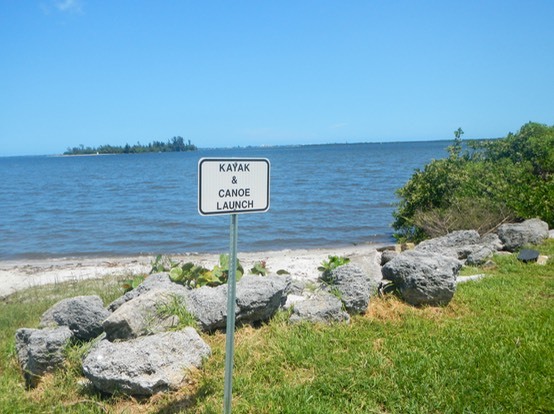 Riverview Park: Located near the intersection of CR 512 E and US 1 in Riverview Park. There is no “official” launch site in Riverview Park. However, there is a great unofficial launch off a beach across Indian River Drive from the park pavilions. Park your car in the grass along side of the sidewalk next to the low locked gate. Carry your boat and gear to the beach and prepare to launch. Before you do, remember to move your car to an approved parking area to avoid a ticket or a fee for towing. The Trip: This trip just adds a few more islands to the itinerary. I usually head east-southeast toward IR6. I decide whether to paddle inside or outside depending on the wind and waves. Then I head north along IR5, which seems like two island connected by a low sandbar. IR4 is mostly gone, so I make the jump to IR3 and continue the paddle as described above. This trip is about six miles overall. IR5 is a great place to take a family for an explore, to swim or for a picnic. Our grandchildren loved it and it’s just enough of a paddle for most of them. 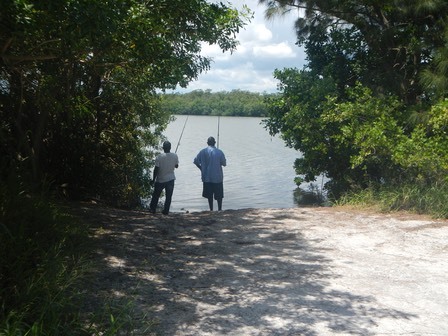 Jungle Trail Launch: Located on the historic Jungle Trail, near Pelican Island National Wildlife Refuge. You can access the Jungle trail from CR 510 (Wabasso Road). Look to your left after crossing the Wabasso Bridge. Or, access the Trail from A1A. Watch for the signs pointing to the Jungle Trail and Pelican Island National Wildlife Refuge. The launch point is small with limited parking. Liik for the only remaining Australian Pines in the area. The launch is under the pines. The Trip: The draw here is Pelican Island, which is somewhat disappointing because wildlife protection markers hold you hundreds of yards away. 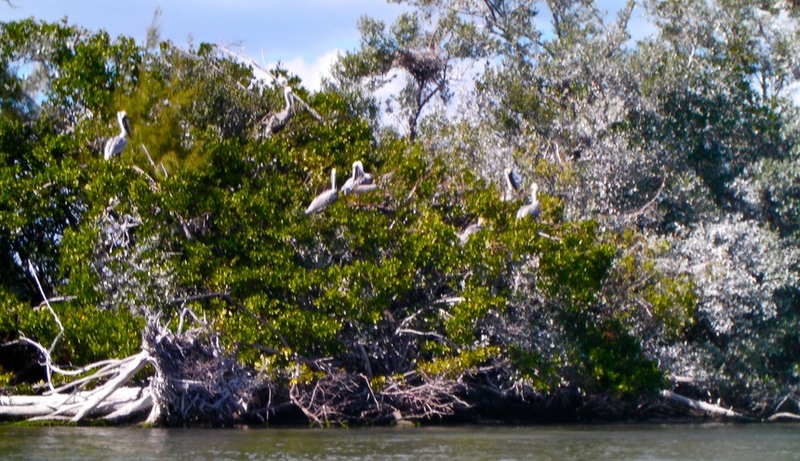 The island got its name from the White Pelicans that nested here. Most of the pelicans have moved on, but the island still teems with other bird life. Just remember to bring binoculars if you want to see any. You can take a circular route by heading north from the launch area toward Pelican Island. Circle 180 degrees around the island and head southeast along the mangrove islands. Keep an eye out for the passage back to the launch point. It should be at about nine o’clock on your left. This paddle can be as long or short as you want. As presented here it is about 2-3 miles. Wabasso Causeway Park: Located on the Wabasso Causeway. From the intersection of CR 510 and US 1 in Webasso, head east on CR 510 (Wabasso Road). The Causeway passes onto an island before the Wabasso Bridge passes over the Lagoon. The launch can be found in the park area to the right, although you can really launch paddle craft from either side of the causeway. 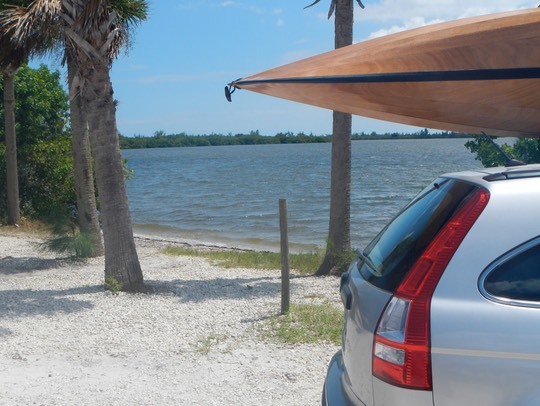 The Trip: The neat thing about Wabasso Causeway is that you can always find a place to paddle out of the wind. The Causeway essentially cuts the Lagoon in half, acting as a huge windbreak. The boat launch is on the north side of the causeway. There are pleasant picnic facilities here and a bathroom with water and flush toilets. You can launch from the busy powerboat ramp if you want. But I prefer to launch from one of the several small sand beaches you’ll find there. My favorite paddle from here is to launch, then paddle west until you can pass under the Causeway. 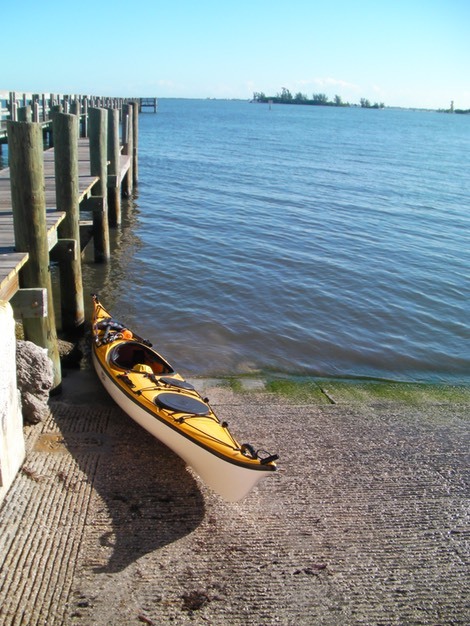 Turn east and paddle along the causeway until you reach the Intracoastal Waterway bridge. Carefully cross the Waterway. You will pass big homes on Orchid Island and a marina so well hidden you never realized it was there. Continue along the shore until you slip in among the mangrove islands. You will find yourself in what feels like a prehistoric, pre-human world. It feels like endless wilderness with hundreds of birds everywhere. I have only done this trip as a one-way (You can pull-out at the Jungle Trail launch site). But you could easily make a roundtrip out of it by cutting back through the mangrove islands to the ICW and back to the Causeway. 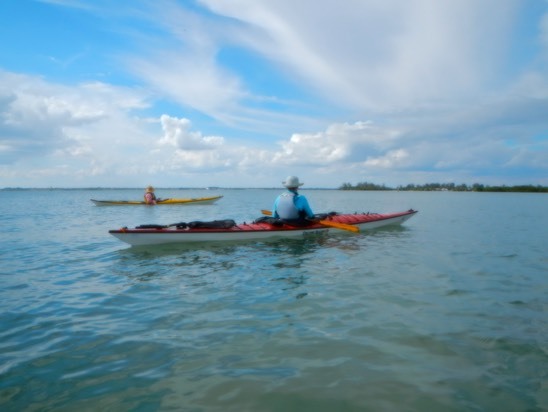 The Trip: While you can paddle in any direction from this launch point, I have generally paddled north across a deep bay, toward a group of mangrove islands where it is fun to poke along close to shore looking for wildlife. This route can overlap with the Long Point route described below. An alternative would be to head south on a one-way to Round Island and the Round Island launch site on the Jungle Trail. 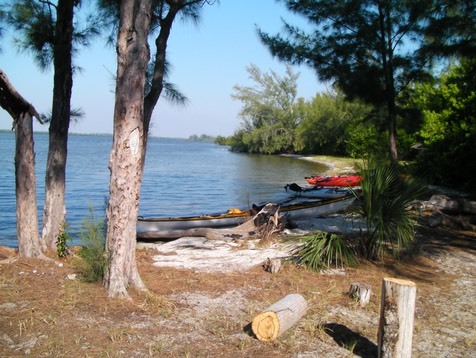 Long Point Park: Long Point Park is a Brevard County Park located about three miles north, beyond Sebastian Inlet State Park. Watch for the park sign on your left. Long Point is an RV park with most sites having direct access to the water. The launch site is through a small concrete boat ramp. It is not generally busy. 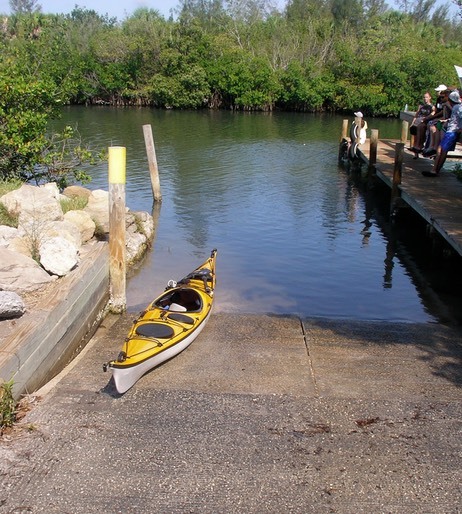 You will find small sandy areas on each side of the ramp where you can launch your boat. There is no fee to launch, but there is a small entrance fee. 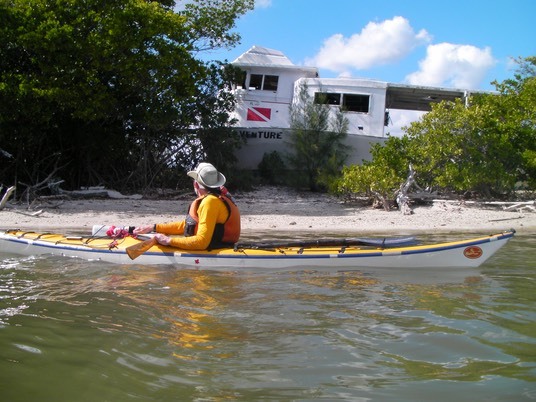 The Trip: At the launch point you can paddle south or north under a footbridge that connects Long Point to a large wooded island. I have done both, but usually head north under the bridge to explore the mangrove islands in that area. After poking around the many mangrove islands here, make your way west until you see the open Lagoon. Working your way south, you will eventually come abreast of the large wooded island mentioned above. I usually continue along the outer shore, eventually following it back to the cut behind the island and the launch point. The trip can be as long or short as you want it to be, but 3 miles or so is about average. 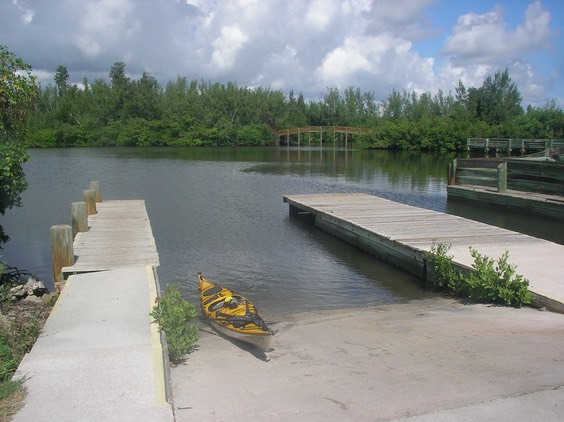 Round Island County Park: Riverside: Round Island County Park is located on A1A several miles south of the Anchorage in Vero Beach. The Park has two parts; Oceanside and Riverside. You want the Riverside, which is on your right if you are heading south. Watch for the park entrance signs. The launch site is at the far end of the parking lot. There is plenty of room to unload your boat and gear. But like so many state and county parks, specific facilities for launching paddle craft are non-existent. The powerboat ramp is adequate and not generally busy, so you should have no trouble launching. There are no entrance or launch fees at this park. The Trip: I’ve never had a bad trip at Round Island. You can head in many directions from the launch point, adjusting your route to accommodate that day’s wind and waves. A typical paddle would be to head north around the immediate islands to pass around Round Island. From there head southwest toward SL1 (The first spoil island in St. Lucie County – SL1). I often stop at SL1 to hydrate, have a snack or just to explore. There are several nice picnic tables there and a sand beach to stretch out on. If you have time, paddle around SL1 before heading back toward a space between Round Island and the coast. Keep your eyes open for wildlife. 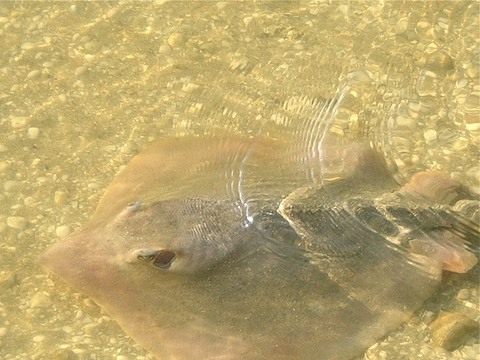 I have seen many active manatees in this area as well as schools of Moon Jellies, dolphins, rays and even a small shark. 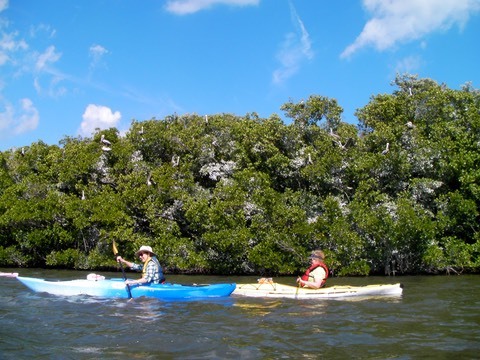 If it is windy, stay closer to shore and explore the many small mangrove islands. 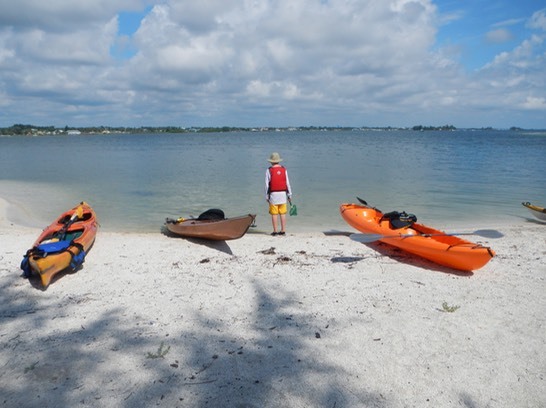 Grant Fisherman’s Landing Park: The Grant Fisherman’s Landing Park is a good place to launch or take a break if you are paddling in Brevard County. It is located north of Sebastian along US 1 in Grant. It is easily seen from the highway, having several buildings, shaded picnic areas and fishing docks. There is no formal launch site at the park that I am aware of. So park you car and scout around for a bit of sand at the shore that is easy to carry your boat to. There are no entrance or lunch fees at this park either. The Trip: I have not actually paddled from this park. A friend and I made a lunch, water and bathroom stop here on a four day trip from Stewart to Melbourne. It is a great little park. We pulled up on a small sand beach that you could easily launch from. If I were paddling from this area I would explore the spoil islands in the area and circumnavigate Grant Island, one of the few inhabited islands in the Lagoon. We saw many dolphins in this area, so keep an eye out for them. You could do a one-way from the Fisherman’s Park to Turkey Creek’s Goode Park. This would be a long paddle but might still allow some time to explore the interesting Turkey Creek.